The leader in Air & Fuel support for Pocket Bikes and performance parts. 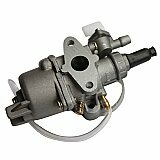 Pocket Bike Carburetors, Fuel Line, Fuel Filter, Air Filter, Gas Fuel Tank, Reeds & More. We offer a comprehensive selection of performance parts for pocket bike and mini bike, providing the best quality and cost effective pocket bike and mini bike accessories.